Home Smart Gadgets Eufy Genie vs Amazon Echo Dot: Best Budget Alexa Speaker? Eufy Genie vs Amazon Echo Dot: Best Budget Alexa Speaker? If you’re in the market for an Alexa powered smart speaker, you’d normally think of the Echo Dot (Rs. 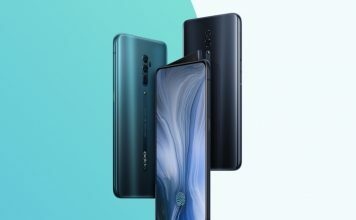 4,499), the Echo, or the Echo Plus. However, if you look around on Amazon, you’ll also spot the Eufy Genie (Rs. 2,199) as being an Alexa powered smart speaker. It’s priced lower than the Echo Dot, and it’s almost the same size. Tempting, isn’t it? However, buying a smart speaker is kind of like an investment; you can’t go changing smart speakers every year. Well, technically you could, but that makes no sense. 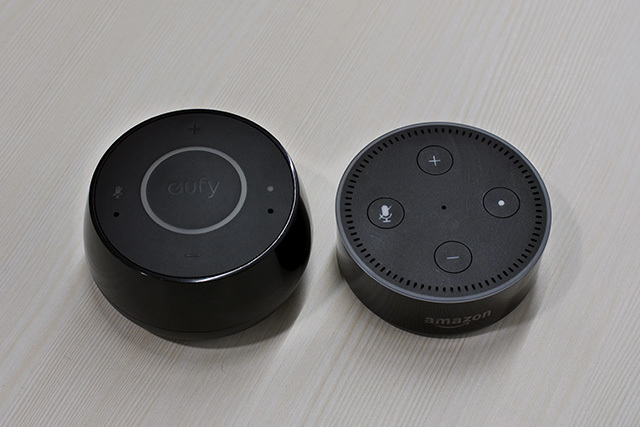 Well, to help you out with picking the best budget small-form-factor Alexa powered smart speaker out there, here’s a detailed comparison of the Eufy Genie and the Echo Dot. In terms of the build and design, both the Echo Dot and the Eufy Genie are meant to be small, tiny speakers that you can put anywhere in your room without them attracting a lot of attention. However, the way these speakers approach this design is vastly different. 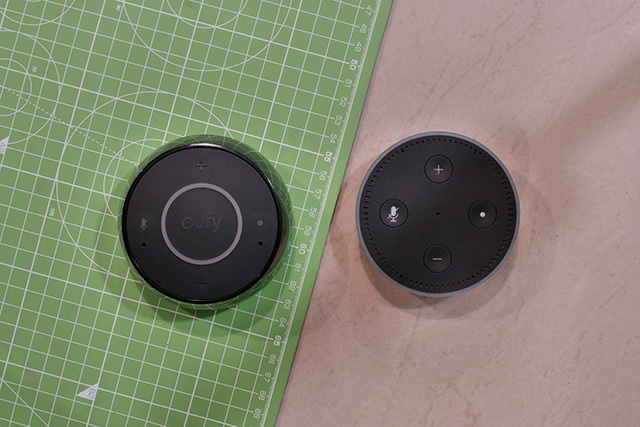 For starters, where the Echo Dot opts to look more like a slice taken out of the bigger, Echo Plus, the Eufy Genie opts for a more curvy design that looks a lot better. The Genie has buttons up-top, similar to the Echo Dot, however, it chooses to include a much smaller light ring than the one you’ll find on the Echo Dot. Plus, the Eufy Genie’s logo on top lights up as well. Whether or not this is great is probably highly subjective, but I personally prefer the Eufy Genie’s light ring. Talking of the buttons, the Eufy Genie’s buttons are more tactile than those on the Echo Dot. 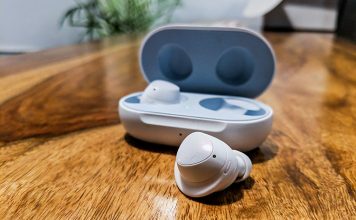 This doesn’t matter much in a smart speaker you’ll end up controlling with your voice, but any time you do press them, the Eufy Genie will feel much better. On the back, both the Echo Dot and the Eufy Genie have the exact same ports. 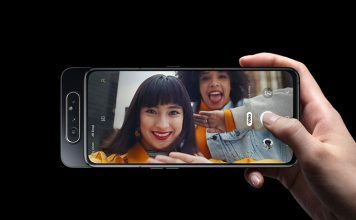 There’s a microUSB port for power, along with an AUX port for connecting them to speakers with a standard AUX cable. The Eufy Genie includes an AUX cable in the box, by the way; something the Echo Dot doesn’t do. For voice recognition, the Echo Dot uses a seven-microphone array whereas the Eufy Genie simply has two far field microphones. This does make quite a bit of difference, and in my usage I found that I had to speak much louder for the Eufy Genie to recognise the wake word than I had to when talking to the Echo Dot. In fact, the seven-microphone array on the Echo Dot is pretty helpful when you’re trying to talk to the Echo from a distance, letting you speak normally to get it to hear your voice. With the Eufy Genie, you’ll find yourself stressing your voice a lot higher to get it to recognise the wake word. Other than that, since both the Echo Dot and the Eufy Genie are using Alexa, the speech detection accuracy is pretty much the same on both. In my personal usage, I did notice that the Eufy Genie was taking a tad longer than the Echo to process my requests after I had spoken them out. I’m not sure why that was happening, but it happened every time. When it comes to sound quality, the Eufy Genie easily beats the Echo Dot by quite a considerable margin. While both the Echo Dot and the Eufy Genie have a similar form factor, the Genie is a magician (pun intended) when it comes to sound quality. Music from the Eufy Genie is not only considerably louder than that from the Echo Dot, it also has a deeper bass, and clearer mids and treble. Personally, I’ve grown very fond of the audio quality from the Eufy Genie. 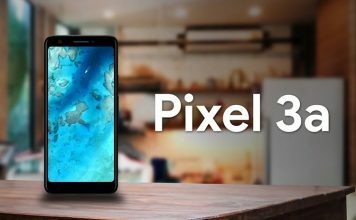 It’s very impressive especially considering the price and the size of the smart speaker. 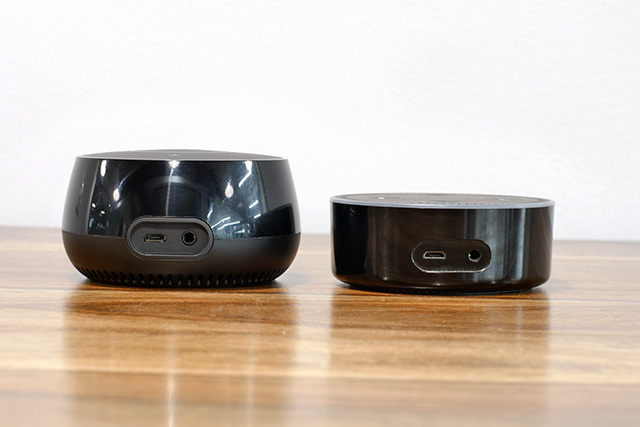 In terms of wired connectivity, both the Echo Dot, and the Eufy Genie come with two ports on the rear — a microUSB port for powering the device, and an AUX port for connecting them to external speakers if needed. However, the Echo Dot takes the lead when it comes to wireless connectivity. 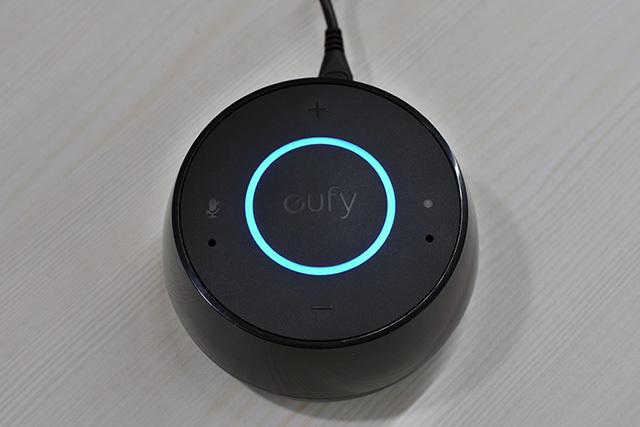 While both the Eufy Genie and the Echo Dot support Bluetooth connections, the Echo Dot comes witth support for both 2.4GHz and 5GHz wireless networks, whereas the Eufy Genie only supports 2.4GHz networks. That might not be a big deal to most people right now, but it’s definitely something some people might be interested in knowing, and I’m not sure why the Genie doesn’t support 5GHz networks. In terms of smarts, there’s absolutely no difference between the Echo Dot and the Eufy Genie. Both the speakers use Alexa as their brain which means they both have access to the same Skills, and the same data for every query you ask them. 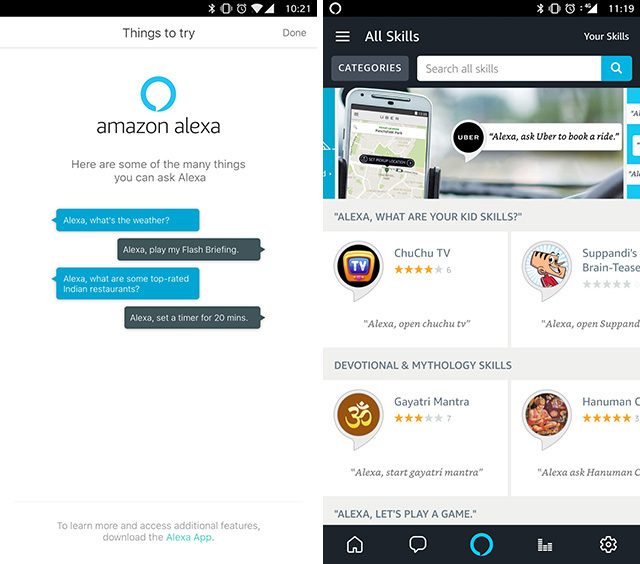 Alexa in itself is a pretty capable smart assistant by the way, thanks to the fact that it has been around far longer than most other virtual assistants, and the huge library of Skills that Amazon has added to Alexa’s Skill Store. Both the speakers are fully capable of answering basic questions such as weather related inquiries, and random questions that might pop into your head. There are also a bunch of games and fun stuff to try with Alexa that you can use on either of the speakers. Alexa also has a wide variety of smart home products that it supports which means you’ll be able to find compatible smart devices with ease regardless of the speaker you’re using. In terms of pricing, the Eufy Genie is priced much lower than the Echo Dot, and can easily be grabbed for a price that hovers around the Rs. 3,000 mark. As of this writing, the Eufy Genie is available for just Rs. 2,199 which makes it an absolute winner as compared to the Echo Dot which is priced at Rs. 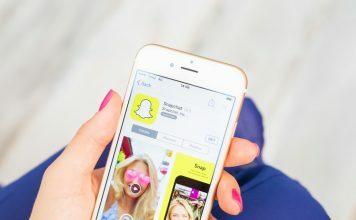 4,499. Both the speakers are available for purchase via Amazon. 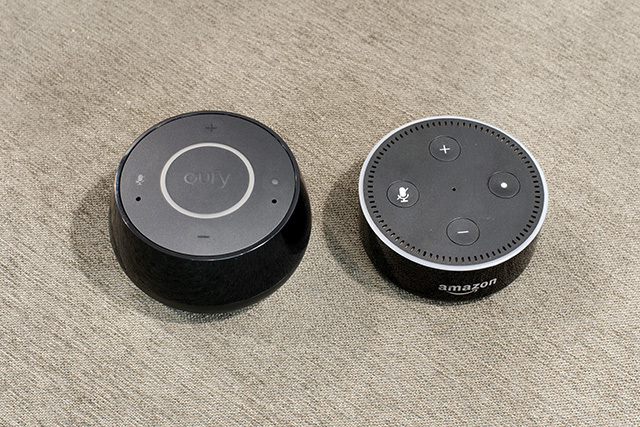 Eufy Genie vs Echo Dot: Which One Is Better? So, with all those things out of the way, the main question that remains is which of the two should you buy? Well, to be honest, I’d suggest the Eufy Genie without doubt. It looks a lot better, it sounds a lot better, and it does everything the Echo Dot can do. Plus, it’s available at a massive markdown as compared to the Echo Dot.